The UW-Madison scholar's talk on "Bibliomigrancy," recorded at a Wisconsin Science Festival edition of Nerd Nite. 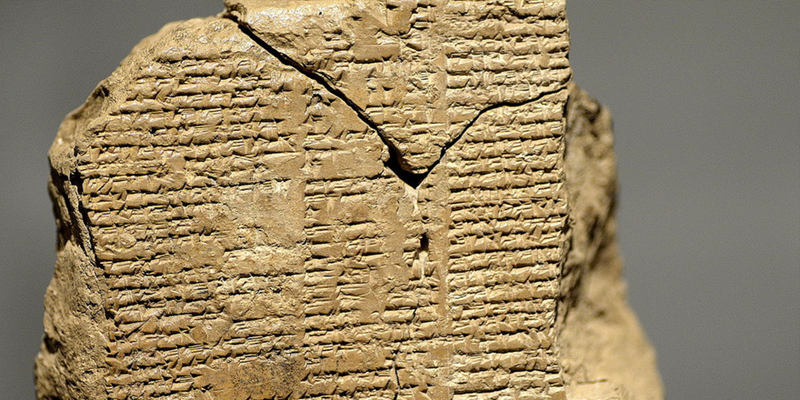 A tablet from the Epic Of Gilgamesh. Photo via Wikimedia Commons. Nerd Nite Madison's talks usually take place at the High Noon Saloon, and will be back there this Wednesday, November 11. But during the 2015 Wisconsin Science Festival this October, Nerd Nite shifted over to the Wisconsin Institutes for Discovery building for a special edition consisting of three presentations from UW-Madison faculty. As usual, we were there recording the talks for the podcast series we produce in partnership with Nerd Nite Madison. The second speaker of the night was B. Venkat Mani, officially a professor of German but more broadly a student of how books and ideas travel—not only across oceans and continents but from oral traditions to stone tablets to print to digital formats. Mani sums it up with the word "bibliomigrancy," and his talk is a brisk, engaging introduction to that concept. (Note: Mani gives a few callbacks here to the night's first talk, a high-energy discourse on color perception by physicist Pupa Gilbert.) If bibliomigrancy sounds a bit abstract, Mani gives it vivid form here, touching on the evolution of digital libraries, his experiences buying books from a Soviet bookmobile during his childhood in India, and the wonder that is the biblioburro. Give it a listen below.